There are approximately 1,500 different species of scorpions roaming the world right now. They can live in a variety of habitats including rain forests, woodlands, deserts, grasslands and everywhere in between. Most prefer warmer tropical or subtropical climates. They prey upon a wide variety of animals and insects and all have the ability to sting. Even though a sting can hurt, very few scorpions are dangerous to humans. Keeping scorpions as pets is becoming increasingly more popular. They are relatively inexpensive to buy and require very little maintenance, much in the way of set up, or care. They can be easily found at pet shops, reptile shows and online dealers and breeders. If you are looking for an interesting and unique pet, a scorpion makes an excellent choice. Information covering everything you need to keep a scorpion as a pet. A guide to the tank, substrate, heating, decor and lighting requirements. A list of food and water needs for a proper diet. 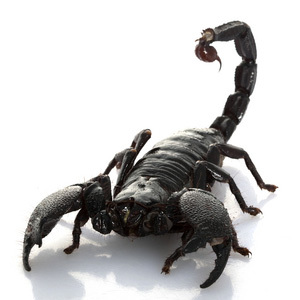 Information about handling, scorpion venom and the symptoms and treatment of a sting. All about the molting process of scorpions as they grow.